Exact to the day, Merkel celebrated its 120th birthday: The traditional company from Suhl was founded in September 1898 and has positioned itself as a supplier of premium hunting guns since the beginning. 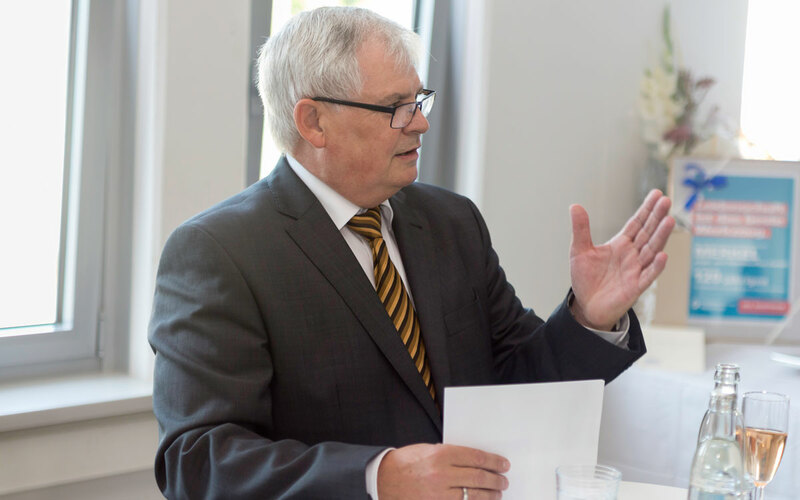 The jubilee program in Suhl consisted out of an official Celebration with suppliers, politicians and executive officers in the Merkel manufacture. Even members of the founders’ families had travelled there from Australia. Already in spring, the jubilee year was celebrated in Nuremberg with a gala in the course of the IWA-weapons exhibition, to which the importers and partners were invited. In a short speech during the celebrations, Managing Director Olaf Sauer gives remembrance to the beginnings during the German empire, pays tribute to the time of two world wars and the GDR and finishes with today’s position of the company. Merkel employs approximately 140 workers in Suhl; members of the Merkel group are the also here seated C.G. Haenel GmbH, another traditional Suhl weapons manufacture, and the tool- and robot-control-systems specialist BWO in Oberndorf am Neckar. Olaf Sauer, who himself is directing the ways of the company for more than ten years, stated, that the brand Merkel had managed to redefine itself more than once in the past. Recently the brand image has been thoroughly revised: “Merkel presents itself today as an innovative company with strong relations to its Suhl roots. For example our bolt-action rifle line Helix offers products which represent the Suhl class in a new technological way.” In the same time, Merkel still produces classic hunting guns of hand-made quality: Dropp barrel rifles and shotguns with a high regard for aesthetics. The assistant to the Merkel management, Bettina Sokolowski, and her team underwent detailed researches about the company’s history before the jubilee celebrations. Out of these findings, not only the contact to the descendants of the founders resulted, but also a small company history, which is documented in the manufacture. This not only includes old Merkel hunting guns and the stories of their owners, but also the stories of the stock-makers, gunsmiths and engravers, who were the founders of the worldwide fame of Suhl guns. During an opening day for workers and their relatives, the families used the rare opportunity to visit the production at Merkel. The last large brand of the old weapons city informatively and enjoyably presented itself and about 400 relatives used this possibility to visit the Schützenstraße, as it is not every day, that you can have a look behind the curtains of gun making. 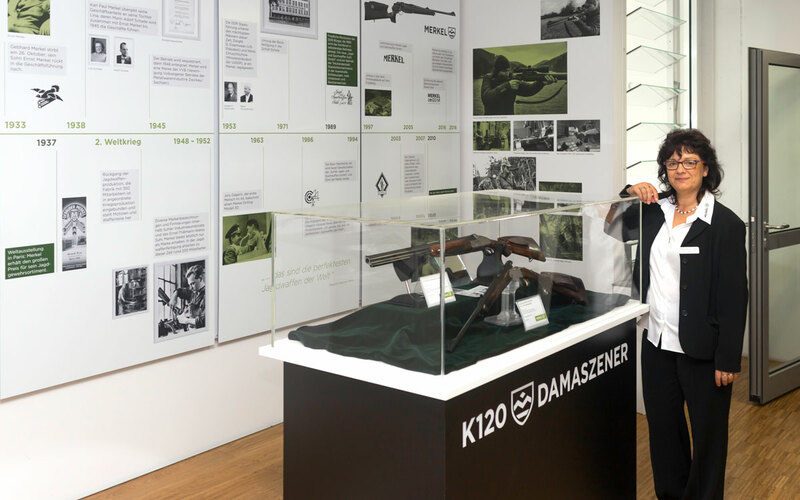 For the jubilee, Merkel has developed a jubilee rifle – the single-shot rifle K120 „Damaszener” has been manufactured from Damascus steel and fine wood in a small batch of 120 pieces – a reminiscence to Suhl, which in the past, as a tribute of the engravers artistry, carried the name “the German Damascus”. The rifle with the serial number 001 was auctioned off by Merkel for a good cause. 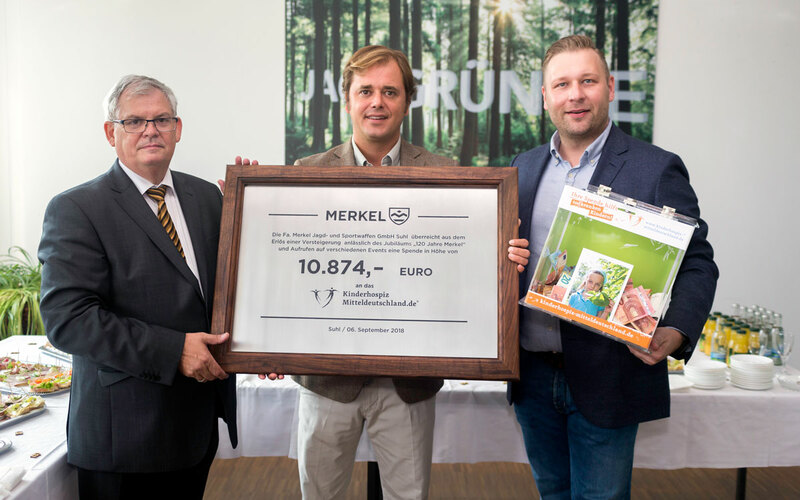 Manuel Matteos, owner of the Spanish TV-station Iberalia TV, won the fine rifle for 9.000 Euro and workers of Merkel, guests and friends of the company raised the sum even higher. The donation went to the children’s hospice Mitteldeutschland in Nordhausen e.V. – Stephan Masch of the hospice’s booster club received the cheque at the official jubilee celebration.